Bill Carman's paintings and illustrations have a very textural look that I really find aesthetically pleasing. 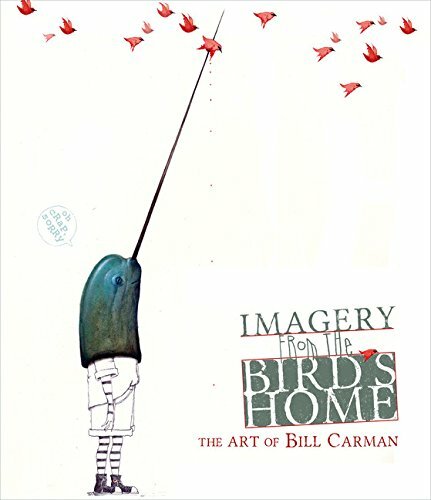 Imagery from the Bird's Home is a 192-page hardcover artbook that collects the artworks Bill Carman has created over the years. I follow Bill Carman's blog and it's great to see a book from him with the actual artworks in print. Although I really wonder how they would look like in real life in actual size and framed. His main medium of choice seems to be acrylic and the surface he draws on can be a panel, wood or copper. There are also sketches and his mixed media works (graphite based) included. It's difficult to describe his subject matter. It definitely has fantasy elements with imaginative characters, settings and symbolism. You really have to check out his blog to get a clearer picture. For example, one painting could be of a giant sea serpent with its head out of the water and there's a boat of people on it with binoculars and cameras, and the next page shows birds carrying a cat that's wearing some sort of goggles, and the next page has a guy transporting an octopus in a special octopus cage on his bicycle. There are also whimsical drawings and doodles from from sketchbooks. Throughout the book, you'll also see preparatory sketches for the paintings. The only minor quibble I have is not all artworks are blown up to maximise the space used. There could have been less white space on some pages. Overall, it's a nice showcase of wonderful artworks.